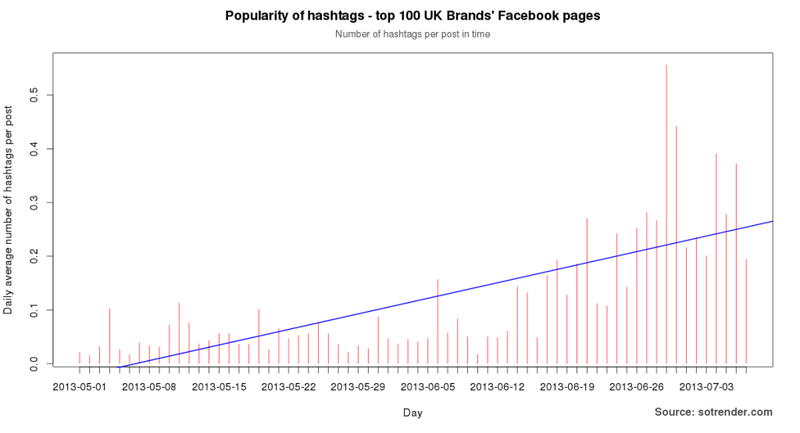 How the biggest UK brands use Facebook hashtags to boost their performance? Hashtags were introduced to Facebook in the middle of June 2013. 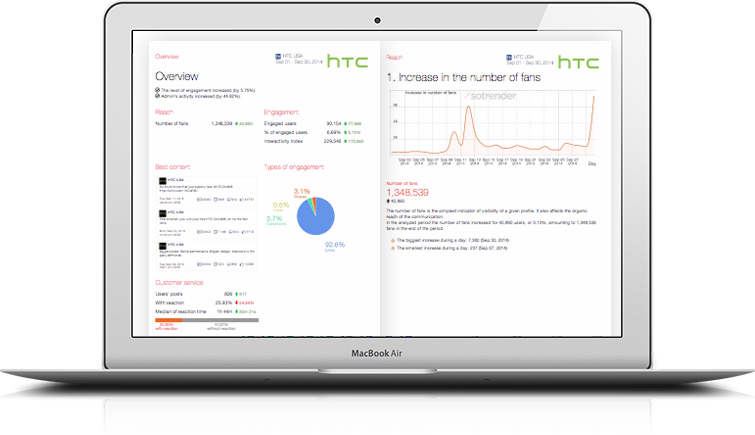 This feature offers brands new possibilities for your marketing communication. It constitutes a new way for people and business to discover and engage in conversation. According to the official Facebook blog, at least. From what we’ve found, it is still difficult to evaluate it’s effectiveness. Although there are tons of tips on how to use hashtags, like the ones given by AllFacebook.com or Ignite Social Media agency, the number of myths about them still outweighs the number of verified facts. 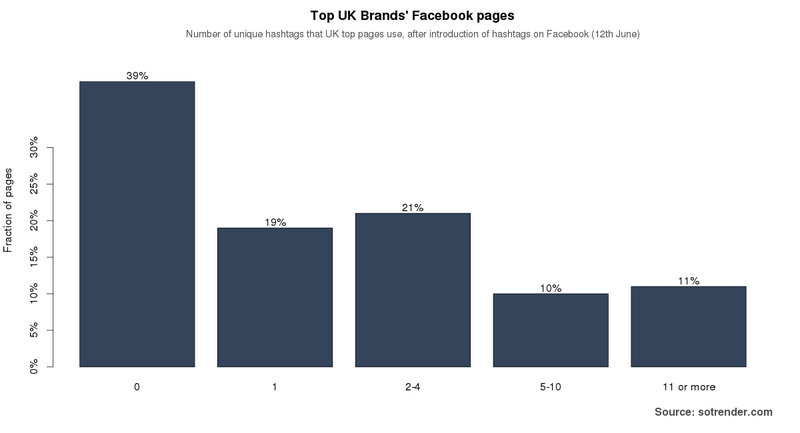 Sotrender’s Research Team analyzed the top 100 biggest Facebook Pages of UK brands in order to check the hard data regarding the use of hashtags and how effective they are. To the best of our knowledge, it’s the first time such a study was published worldwide. Currently, hashtags are added to every other post. But both their overall popularity and the number of them per post is growing. On the other hand, some brands still haven’t tried using hashtags. So far, only 61 of the top 100 UK brands have published a post with at least one tag. Out of those who did, most used no more than 4 unique tags, as shown in Figure 2. So it’s not clear whether it’s better to use a few hashtags that are strongly connected with your brand or to use many general hashtags. As you can see, most pages didn’t use any hashtags, nor did they use them 2-4 times. There were the ones that used one tag in one single post, but there were also pages that published one hashtag multiple times, like Pepsi Max. They wrote the tag #livefornow 5 times. Or there’s Fox Searchlight Pictures, who used the tag #wearetheeast 8 times, referring to a new film. It might be a deliberate strategy to use just a few hashtags that are strongly connected with your brand. Another viable method is using lots of general hashtags. As much as 21% of all analyzed pages used 5 or more tags. Leaders in this category were: Troy Lee Designs (56 different hashtags), BBC Radio (47), and Red Bull Racing (35). The most popular tags are displayed on the tagcloud below. Interestingly, quite a lot of them relate to F1 GPs at Silverstone and Nuremberg. 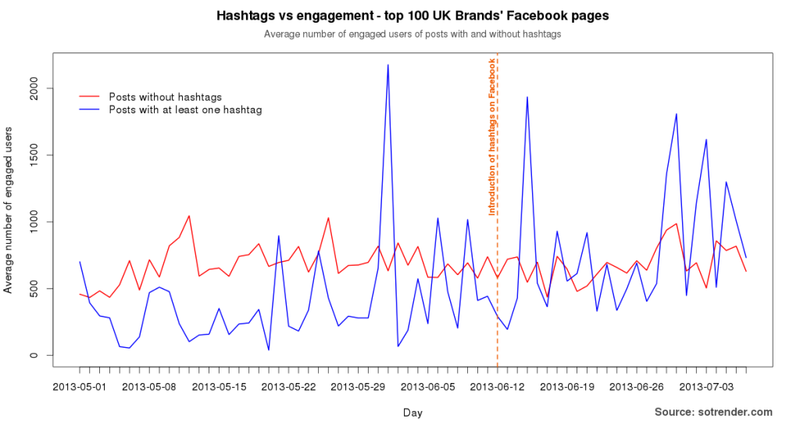 Do hashtags influence engagement? 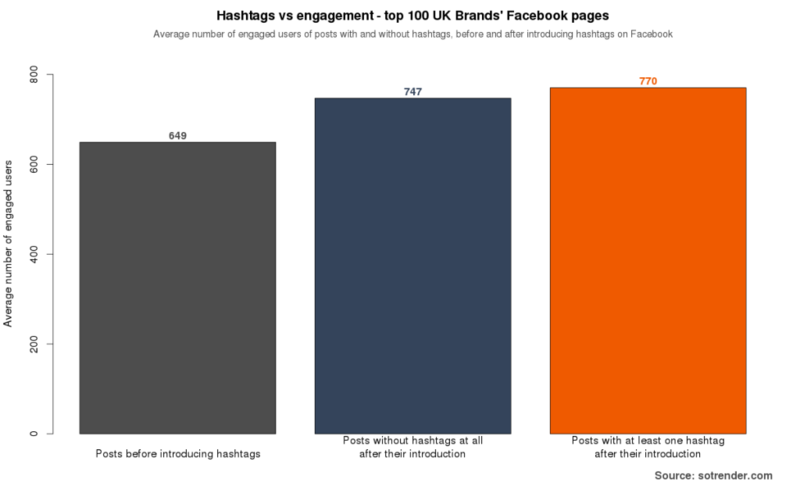 On Figure 4 we compared the average engagement of posts with and without hashtags, before and after their introduction. The chart shows that after the introduction of hashtags, posts containing them started to gain a higher average number of engaged users (users who performed at least one activity concerning a particular post – liking, commenting, etc.). 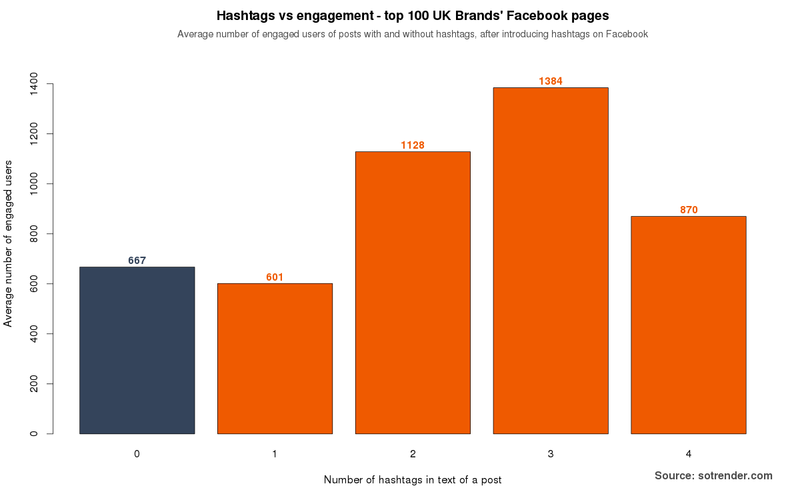 You can see the peaks of engagement caused by the posts with hashtags, but it is hard to say whether the posts containing hashtags are significantly better than the ones without them. Another possible explanation for this phenomenon is the fact that hashtags were adopted faster by pages which engage users better and in general adopt innovations faster. On the whole, the number of engaged people on the top pages is growing as time passes. As you can see, both average posts with and without hashtags after 12th June engage more users than the average post before introducing hashtags. However, this might be because of the regular growth that occurs in terms of fans, engagement, and interactivity over time. What’s more interesting is the fact that posts with hashtags engaged more fans than those without. However, the difference isn’t all that big. The increased total engagement itself caused a slightly bigger difference. How many hashtags in one post? Of the 61 brands that used hashtags in their posts, two or more than two hashtags were used 134 times, while 413 posts contained only one tag. The number of hashtags in a post seems relevant, but surprisingly posts with only one hashtag were less engaging than those without. 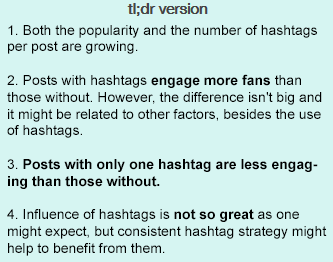 The difference between those two was subtle, but posts containing 2 or 3 hashtags engaged way more users. This proves the importance of a deliberate hashtag strategy that includes scheduling and choosing the right number of tags. Moreover, posts with a hashtag take longer to gather 50% of all activities, which includes likes, comments, and shares. The difference isn’t very big, however. If it will remain the same over the next couple weeks, it might be just be users who found the post through the tag search. To conclude, the influence of hashtags is not as great as one might expect. The data from UK top 100 biggest brand pages show that hashtags have a positive impact on engagement, but so far this relationship is weak. What one person considers weak, someone might judge to be strong. But you can compare these results with the after-effects of introducing timeline, which were also analyzed by Sotrender Research Team and posted on our blog. This analysis covers the period between 1st, May and 5th, July. The forthcoming weeks will truly tell us how great the influence of hashtags really is. But as we have shown, you shouldn’t underestimate them just yet. Over time, we’ll see how hashtags truly affect content organization on Facebook and Graph Search.